Educators know that when it comes to building relationships, class size and the number of students per teacher matter. While class size is certainly an issue for elementary school students, it becomes even harder for secondary school teachers who may have 150 students or more. Consider that students have 1, 2, or more parents or guardians each, and we’re talking about a lot of people! How can teachers really do the important relationship-building work necessary with so many people involved? Of course lowering student loads is one of the best ways to address this issue, but if that is not a reality for you right now, there is help. When we embrace tech to end teaching as we know it, we open the doors to relationship-building opportunities. Check out these free tools you can use to more deeply connect with student and their parents or guardians. and teach in a way that focus on their strengths. Wouldn’t it be great if you could have a profile that uncovered every child’s passions and unique strengths? You do and it’s called Thrively. This tool allows you to identify every child by what they care about and how they best learn and it is free! Students are more than just a number. Thrively reveals each child’s genius and helps you to better understand their unique interests and motivations.The learning profile finally gives teachers a tool that helps them get to know their students better and can help them realistically customize how children learn based on what works best for them. 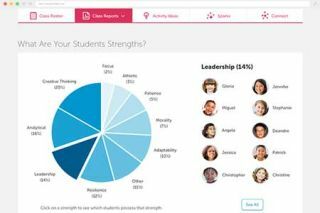 Read more about using Thrively at school here. Start an online space in Edmodo, Google, or Facebook for your students. All platforms allow you to secure privacy settings while getting to know your students better and help keep conversations going. When you host an online community for students you help provide positive digital citizenship experiences in a safe environment and also teach students strategies to engage in and build a personal learning network. What are the favorite ways for teens to communicate? For many it is via texting. Teachers can build relationships by safely doing that with their students. Cel.ly is a free group texting service. Group texting saves time, improves communication, provides documentation of texts, and sets the stage for easily using many other cell phone tools. The Cells referred to in Cel.ly are instant mobile networks. With Cel.ly, you can have open group chat, one-way alerting, or a hybrid where curators can approve messages. Cel.ly also provides security and privacy as phone numbers are never exposed and there are controls. Cell curators filter messages before they are sent to the group. This keeps discussion on-topic and reduces abuse, impersonation, and cyberbullying. Cel.ly also has a built-in polling feature complete with the tabulation of results. Cel.ly provides a great way for teachers to get and stay connected to students using a communication method they love. This becomes a powerful tool to strengthen both relationships and learning. Read more about Cel.ly here. While we know that parents wish they could spend more time at their child’s school, unfortunately, busy schedules often don’t provide such opportunity. However, when a teacher sets up a Twitter account and informs the families that they can get live updates from the class, the library, or around the school, we take the age old question, “What did you do in school today?” to a new level! Teachers like Grace O’Keefe, leaders like Matt Brown , and librarians like Tracy Karas are doing just that. Click on their names to see the type of information they are sharing. You can read how to set it up here. Remind provides a safe, one-way, mass text messaging system created specifically for use in Education. It keeps your phone number, and the phone numbers of your subscribers completely private, stores all of your sent messages, and it's completely free to use. Just sign up and create a list for others to join via a simple text or email. Because of the convenience of sending messages directly to phones, Remind is a perfect tool for staying in touch with parents. Send them announcements and reminders such as school holidays, school events, photo days, fundraising events, and more. The best way to know what to send the parents, though, is to ask them what they want to know. Read ways it is being used in schools here. Start a Facebook group or page to give parents a window into their child’s classroom. Have students do the updates. Not only is this a great way for parents to stay in the loop about what is going on, it also gives students a chance to publish for a real audience. See how Ms. Schoening did this with her first-grade class here. Class Story is free online resource that helps teachers encourage students through positive behavior management. Class Story lets teachers safely and instantly share important updates, amazing moments, and announcements to all parents. Parents can show their appreciation with hearts. Teachers can instantly see which parents have viewed the update.You can read more here. Over the years, I have been fortunate to have the opportunity to support thousands of educators, their students, parents, and others to do this type of work both by sharing ideas here at the Innovative Educator as well as in my work as a public school educator. If you are someone I have supported in using one of these tools, please share your story. I’d love to hear it. If you have other ideas, please share those, too, in the comments.